These words were first spoken by the daimyo Oda Nobunaga, many years ago. Then, he was still only one lord among the many warlords who battled for supremacy during the bloodiest time in Japan's history. This period is called the Warring States period, and that is exactly what it was: a time when Japan was divided into many little states, each ruled by a daimyo (lord). These daimyos battled endlessly for control of the country. About this time, a young and ambitious daimyo named Oda Nobunaga seized the Oda clan from his brothers, and took control of the province called Owari. From there, he launched attacks on nearby countries, and quickly came to rule all of central Japan. He was the first daimyo to get this far in his quest for supremacy. Now, on the morning of June 2nd, 1582, his banner boldly announced his presence in the city of Kyoto. Yet, beneath his fearsome standard, Nobunaga slept restlessly. On the top of the nearby Rono hill, field marshal Akechi Mitsuhide gathered his troops around him. The first light of dawn cast a shadow across his face, masking his dark features. The men, armed with spears, swords, and rifles, whispered nervously while they waited for their leader to speak. You see, Mitsuhide had once been Nobunaga's greatest general, and had fought in may campaigns alongside his master. His love for his lord was so strong, that once, in order to convince the enemy Hatano clan of Nobunaga's trustworthiness, he gave them his own mother as a hostage. This was a tragic mistake. Nobunaga betrayed the Hatanos and Mitsuhide's mother was put to death. Ever since, Mitsuhide was sullen and quiet in the presence of his lord. The men were ready for action. Rumors has been spreading for weeks of how they were to go into action in southwestern Japan. With north and central Japan already accounted for, victory in the southwest would spell final success for Nobunaga. Surely it was the excitement of such a thought that caused their leader, Mitsuhide, to savor this moment, and draw out this silence. Then, Mitsuhide spoke. "My men, I know how eager you must be for battle. For weeks, you have listened to the battle reports from the southwestern front. I expect that you are ready to march this very morning, ready to die for your master. "I, too, showed such loyalty to my master, once. But no longer. From today, I am your master, not Nobunaga. You will not march to battle in the southwest, because his enemy is not yours. Your enemy is my enemy." Mitsuhide paused, and pointed directly at the banner of Lord Oda. "And my enemy is the Honno Temple." Oda Nobunaga woke to the sound of distant gunfire. He was immediately alert, and in a single practiced motion, leaped from his sleeping mat and drew his sword. With his back against the wall, he held his sword at the ready, and listened. Just then, Mori Ranmaru, Nobunaga's young page, burst into the room. Ranmaru bled from several small sword wounds, and his uniform was torn and soaked. His eyes were wide with terror. "My Lord! We are besieged!" he cried. "By how many? And how did they manage to get past Mitsuhide's guards? Answer me at once!" Ranmaru was near tears as he answered, "The enemy numbers over 13,000, and they are none other than your own troops, led by field marshal Mitsuhide." "Mitsuhide? A traitor? Unbelievable!" Nobunaga's voice dropped to barely a whisper. Then, with great speed, he donned his battle armor and stalked out of the room. 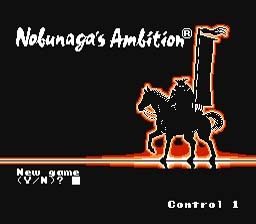 --From the NES Nobunaga's Ambition instruction manual.